HomeCaplor UpdatesCaplor NewsWhat is climate change? Do you sometimes just need a little refresh on what all this climate change is about ? Here the BBC News takes a simple look at what we know and don’t know about the Earth’s changing climate. The planet’s climate has constantly been changing over geological time. The global average temperature today is about 15C, though geological evidence suggests it has been much higher and lower in the past. However, the current period of warming is occurring more rapidly than many past events. Scientists are concerned that the natural fluctuation, or variability, is being overtaken by a rapid human-induced warming that has serious implications for the stability of the planet’s climate. What is the “greenhouse effect”? The greenhouse effect refers to the way the Earth’s atmosphere traps some of the energy from the Sun. Solar energy radiating back out to space from the Earth’s surface is absorbed by atmospheric greenhouse gases and re-emitted in all directions. The energy that radiates back down to the planet heats both the lower atmosphere and the surface. Without this effect, the Earth would be about 30C colder, making our planet hostile to life. Scientists believe we are adding to the natural greenhouse effect with gases released from industry and agriculture (known as emissions), trapping more energy and increasing the temperature. This is commonly referred to as global warming or climate change. The most important of these greenhouse gases in terms of its contribution to warming is water vapour, but concentrations show little change and it persists in the atmosphere for only a few days. On the other hand, carbon dioxide (CO2) persists for much longer (it would take hundreds of years for it to return to pre-industrial levels). In addition, there is only so much CO2 that can be soaked up by natural reservoirs such as the oceans. Most man-made emissions of CO2 are through the burning of fossil fuels, as well as through cutting down carbon-absorbing forests. 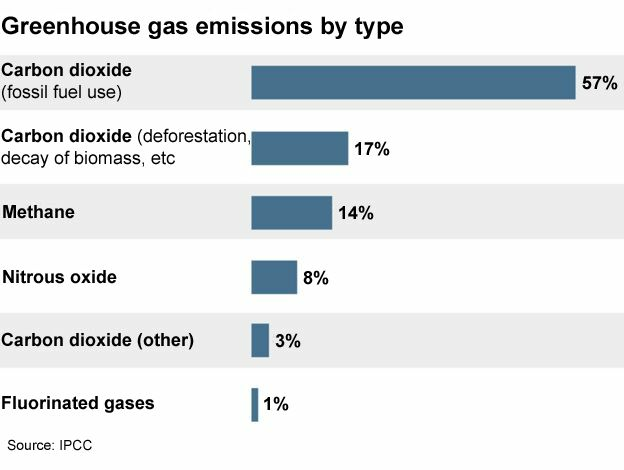 Other greenhouse gases such as methane and nitrous oxide are also released through human activities, but their overall abundance is small compared with carbon dioxide. Since the industrial revolution began in 1750, CO2 levels have risen by more than 30% and methane levels have risen more than 140%. The concentration of CO2 in the atmosphere is now higher than at any time in at least 800,000 years. What is the evidence for warming? Temperature records going back to the late 19th Century show that the average temperature of the Earth’s surface has increased by about 0.8C (1.4F) in the last 100 years. About 0.6C (1.0F) of this warming occurred in the last three decades. Satellite data shows an average increase in global sea levels of some 3mm per year in recent decades. A large proportion of the change in sea level is accounted for by the thermal expansion of seawater. As seawater warms up, the molecules become less densely packed, causing an increase in the volume of the ocean. But the melting of mountain glaciers and the retreat of polar ice sheets are also important contributors. Most glaciers in temperate regions of the world and along the Antarctic Peninsula are in retreat. Since 1979, satellite records show a dramatic decline in Arctic sea-ice extent, at an annual rate of 4% per decade. In 2012, the ice extent reached a record minimum that was 50% lower than the 1979-2000 average. The Greenland Ice Sheet has experienced record melting in recent years; if the entire 2.8 million cu km sheet were to melt, it would raise sea levels by 6m. Satellite data shows the West Antarctic Ice Sheet is also losing mass, and a recent study indicated that East Antarctica, which had displayed no clear warming or cooling trend, may also have started to lose mass in the last few years. But scientists are not expecting dramatic changes. In some places, mass may actually increase as warming temperatures drive the production of more snows. The effects of a changing climate can also be seen in vegetation and land animals. These include earlier flowering and fruiting times for plants and changes in the territories (or ranges) occupied by animals. How much will temperatures rise in future? In its 2013 assessment of the science, the Intergovernmental Panel on Climate Change (IPCC) forecast a range of possible scenarios based on computer modelling. But most simulations indicate that global surface temperature change by the end of the 21st Century is likely to exceed 1.5C, relative to 1850. A threshold of 2C had long been regarded as the gateway to dangerous warming. More recently, scientists and policy makers have argued that keeping temperature rise to within 1.5C is a safer limit for the world. An IPCC report in 2018 suggested that keeping to the 1.5C target would require “rapid, far-reaching and unprecedented changes in all aspects of society”. Even if we cut greenhouse gas emissions dramatically now, scientists say the effects will continue because parts of the climate system, particularly large bodies of water and ice, can take hundreds of years to respond to changes in temperature. It also takes greenhouse gases decades to be removed from the atmosphere. There are varying degrees of uncertainty about the scale of potential impacts. But the changes could drive freshwater shortages, bring sweeping changes in food production conditions, and increase the number of deaths from floods, storms, heat waves and droughts. This is because climate change is expected to increase the frequency of extreme weather events – though linking any single event to global warming is complicated. Scientists forecast more rainfall overall, but say the risk of drought in inland areas during hot summers will increase. More flooding is expected from storms and rising sea levels. There are, however, likely to be very strong regional variations in these patterns. Poorer countries, which are least equipped to deal with rapid change, could suffer the most. Would you give up beef to help the planet? Plant and animal extinctions are predicted as habitats change faster than species can adapt, and the World Health Organization (WHO) has warned that the health of millions could be threatened by increases in malaria, water-borne disease and malnutrition. As an increased amount of CO2 is released into the atmosphere, there is increased uptake of CO2 by the oceans, and this leads to them becoming more acidic. This ongoing process of acidification could pose major problems for the world’s coral reefs, as the changes in chemistry prevent corals from forming a calcified skeleton, which is essential for their survival. Computer models are used to study the dynamics of the Earth’s climate and make projections about future temperature change. But these climate models differ on “climate sensitivity” – the amount of warming or cooling that occurs as a particular factor, such as CO2. goes up or down. Models also differ in the way that they express “climate feedbacks”. Global warming will cause some changes that look likely to create further heating, such as the release of large quantities of the greenhouse gas methane as permafrost (permanently frozen soil found mainly in the Arctic) melts. This is known as a positive climate feedback. But negative feedbacks exist that could offset warming. Various “reservoirs” on Earth absorb CO2 as part of the carbon cycle – the process through which carbon is exchanged between, for example, the oceans and the land. The question is: how will these balance out?